Thousands of Filipino migrant workers were asked to take advantage of the mandatory repatriation efforts of the government in conflict-stricken countries for their own safety and general well-being. Catholic Bishops’ Conference of the Philippines – Episcopal Commission on Migrant and Itinerant People (CBCP-ECMIP) and the Department of Foreign Affairs has strengthened their call on OFWs in Libya, Syria and Yemen to leave these countries. CBCP-ECMI Chair, Balanga Bishop Ruperto Santos has expressed hope that OFWs will be endowed with the wisdom to think of their lives and well-being ahead of the opportunity to earn money”. This call was aimed at ensuring the protection of OFWs first before monetary consideration. 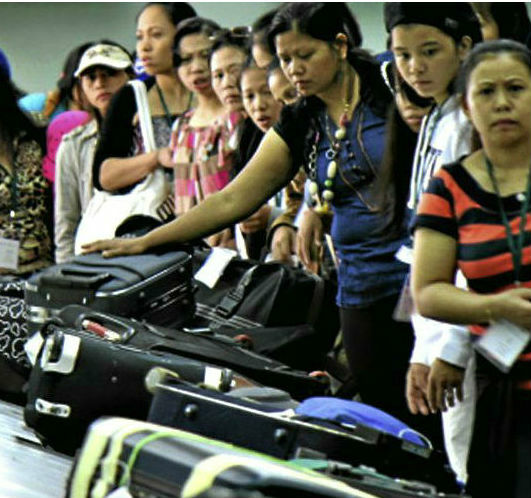 Reports show that OFWs leave the country for higher-paying overseas employment in order to give their love ones a better life. For such feat, the OFWs were lauded for their selflessness and sacrifices benefiting their families and in keeping the Philippine economy afloat. According to reports, the repatriation opportunity was extended to some 4,000 OFWs working in hospitals and medical facilities in Libya. However, out of this number, only a few have positively responded to the repatriation offer of the government. On the same note, Santos likewise disclosed that the Philippine Embassy in Syria has supported the call of the government by talking to some 5,000 to 6,000 Filipino migrant workers to submit themselves for repatriation. Meanwhile, roughly 1,000 Filipinos are now awaiting the government’s crisis management team in Yemen. While Santos admits that the church can do nothing to stop OFWs from leaving the country, he expressed hope that they will grab the chance of going back to the Philippines through the repatriation program of the government. He said the CBCP-ECMIP remains firm on their stand that Filipinos should work in their own country instead of seeking greener pastures in foreign lands at great sacrifice of their families. Santos further disclosed that the 29th National Migrants celebration highlights the magnificence of family members staying together, united in their love with one another.